Earlier this season, Republic welcomed back its only boys state champion basketball team in school history to that point—the 1963 Class M state champions that featured All-Staters Howard Arndt and Don Carlson. Fifty years after that seminal moment in Tiger sports history, Republic has another boys basketball champion that will be long remembered. 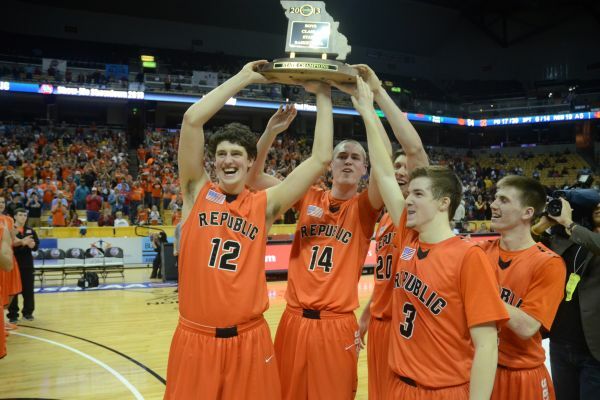 Republic overcame a six point fourth quarter deficit to defeat Normandy 54-51 and capture the Class 4 state title on Mar. 16 at Mizzou Arena. The win capped a magical season for the Tigers, as Republic posted a 28-4 record in head coach Trevyor Fisher’s first season at the helm. After a relatively uneventful trek through District, Sectional and state quarterfinal play, Republic turned up the drama when the Tigers reached Columbia. 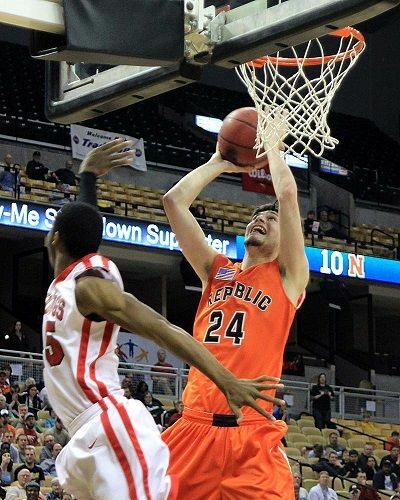 Republic needed a put back from All-State senior Marcus Miller in the final seconds to defeat Liberty North 39-38 in the state semifinals, which advanced Republic to the state title game. Republic led Normandy 22-12 early in the second quarter, but the Vikings turned up the defensive pressure and went on a long run to lead 26-25 at halftime after forcing 12 Republic turnovers in the half. Normandy upped its lead to 42-36 at the end of the third quarter behind the play of Kevin McLemore, the younger brother of Kansas’ standout freshman Ben McLemore. The Tigers opened the fourth quarter with an 8-0 run to take a 44-42 lead, and hit some crucial free throws in the final minutes to earn the state title. 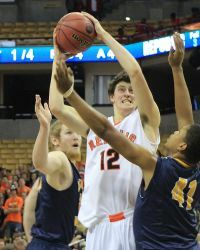 Junior All-State honoree Cody Geiger led the Tigers with 20 points and 10 rebounds. Although Geiger’s effort keyed the Tiger victory in the state title game, Republic featured a balanced line-up all season long, with seemingly a different Tiger stepping up to lead the team each game. That balance made the Tigers a dangerous and versatile team—and one that was hard to game plan for opponents. Entering this season, the Tigers felt like they had the talent to have a nice year. Republic opened some eyes early on by winning its own tournament with a 56-46 victory over perennial state powerhouse Hillcrest in the championship game. The Tigers followed that up by winning the Gold Division title at the annual Blue & Gold Tournament—the Tigers’ second straight Blue & Gold crown. 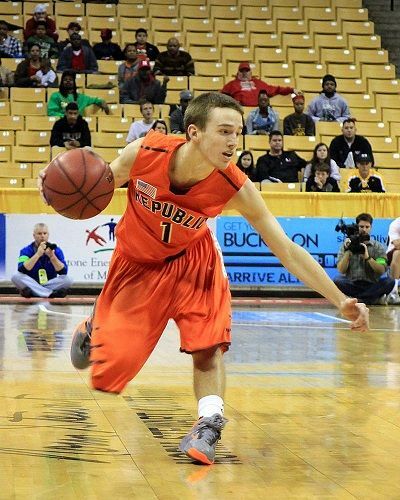 Republic did hit a bump in the road in early February, though, in dropping back-to-back games at Nixa and Willard. The Eagles’ Austin Ruder hit a game-winner in a 43-41 win on Feb. 8, while Willard rolled to a 61-42 victory four nights later. Properly refocused, Republic did not lose again, reeling off nine straight victories. 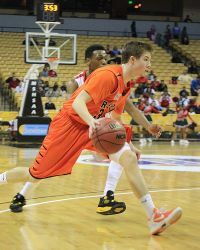 The streak included a 59-48 victory in the regular season finale over Branson, which captured the Central Ozarks Conference (Large Division) crown in the wake of the Tigers’ losses to Nixa and Willard. This year’s state championship is extra special since it comes in the “golden anniversary” of the school’s only other boys basketball state championship in 1963. On Dec. 20, Republic recognized the 1963 state title team and the school’s multi-year All-State honorees. Members of the 1963 team and its coach, Leland Brown, have been regular supporters of this year’s team throughout the season. This is the second straight season that the basketball-crazy community of Republic has celebrated a state championship, after the Lady Tigers brought home a Class 4 crown in 2012. In his first season, Fisher set the bar impossibly high by posting a 28-4 record and winning a state championship. Oh, and Fisher also garnered Class 4 Coach of the Year honors from the Missouri Basketball Coaches Association for good measure. After winning the school’s first boys basketball state championship in 50 years, it is likely that this group of Tigers will not soon be forgotten by anyone. Originally published in the March 2013 issue of Ozark Preps Illustrated.